If your head spins at the thought of 105 sensors collecting 12 data points every 15 minutes for all 19 houses competing in the U.S. Department of Energy Solar Decathlon 2013, you might want to pay a visit to Miss Barbara. This bodiless mannequin acts as the student liaison for the instrumentation team. Perhaps the steadiest head on the competition site, Miss Barbara helps student decathletes locate the instrumentation trailer when questions arise about measured contests. Steve Lappi is the health and safety officer of the U.S. Department of Energy Solar Decathlon 2013. Before the competition, we asked him five questions to learn more about him and his role. Solar water heating systems make hot water for residential uses such as bathing, laundering, and dish washing. Generally less expensive than photovoltaic panels, these systems provide homeowners with a cost-effective way to harness the sun’s energy. Chuck Kurnik is the site operations manager of the U.S. Department of Energy Solar Decathlon 2013. Before the competition, we asked him five questions to learn more about him and his role. Richard King is the founder and director of the U.S. Department of Energy Solar Decathlon. We asked him five (okay, six) questions to learn more about him and his role. Volunteer for the U.S. Department of Energy Solar Decathlon 2013 and XPO! The U.S. Department of Energy Solar Decathlon 2013 and XPO would not be possible without the contributions of hundreds of volunteers. Their work supports and celebrates the remarkable collegiate teams who bring their energy-efficient, solar-powered houses and their passion to the Solar Decathlon. 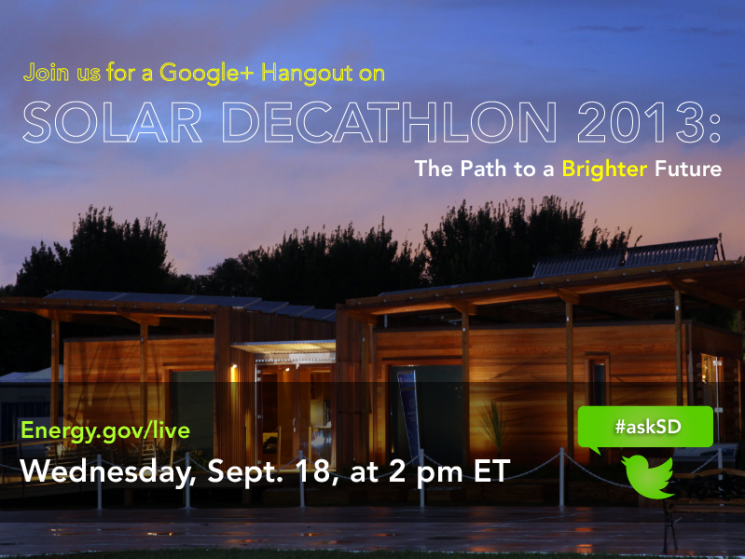 For the teams competing in the U.S. Department of Energy Solar Decathlon, every cent counts. From researching design options and building supplies to transporting houses and communications materials, the costs of developing a competition house can add up. But before the teams even start on the building process, they must first master the art of fundraising. One of the most challenging aspects of the U.S. Department of Energy Solar Decathlon is something very few people, including the team members, see. Each of the student-built, solar-powered houses must travel from collegiate campuses across the United States and around the world to the competition site in Irvine, California. As the decathletes watch two years of hard work being hauled away, they are left to hope that everything arrives safely at Orange County Great Park later this month.